Organize notes, files, project lists and contact information with index cards. Sturdy tagboard ruled 1/4". Super Bright assorted 5 colors: Hot Pink, Hot Yellow, Hot Blue, Hot Orange and Hot Lime. Each package is film wrapped and is topped with a colorful, retail friendly sticker. Recyclable. 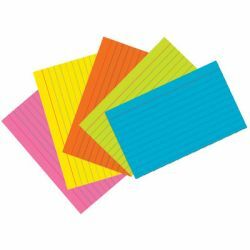 Ruled index cards are ruled 1⁄4".